As the weather slowly starts getting warmer, what to wear becomes such a difficult decision. I know I constantly struggle with this. How to layer and what outerwear to put on feels like I'm about to perform brain surgery. If I make the wrong decision, I'm screwed for the whole day. One easy way to incorporate a 'spring' feeling is by introducing colored prints. During this transitional period, it is the perfect way to make winter looks feel fresh and new. The garment itself doesn't have to be a spring piece- the silhouette can still be fully covered and warm. For an example, this dress is long sleeved and has a turtleneck. 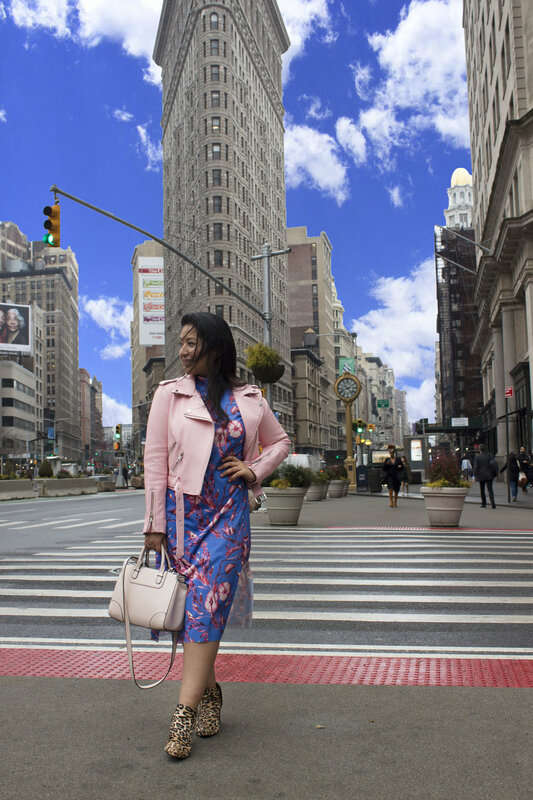 Shop this exact midi printed jersey dress here. For an additional layer, bring the leather jacket back out. It's a great layering piece that never goes out of style. 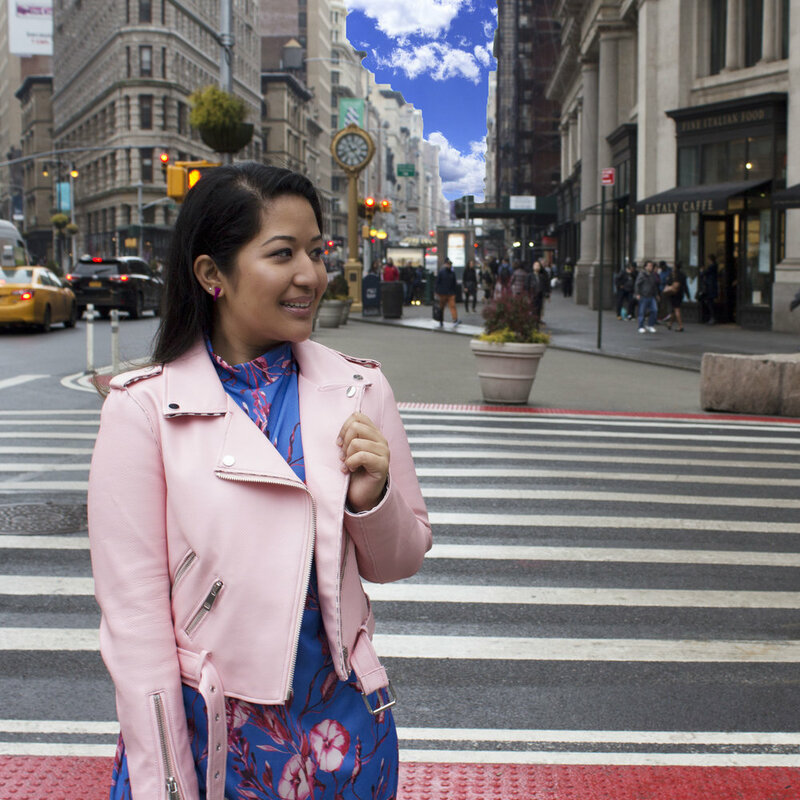 If you want to add some color to your wardrobe, try a fun colored jacket. It is a statement piece that I'm sure you'll get tons of compliments on. It looks good with all black too! To add even more interest, play with prints. Pull in a animal, stripe, checkered, or polka dot print. These prints are basic and match any color and other prints seamlessly. Until it's officially spring, I believe in wearing close toed shoes. Unless you live in a warm climate city (which I'm currently jealous of), I think this rule is key. For a transitional shoe I think ankle length booties, flats, pumps, and oxfords are great shoes. These keep the look grounded, feeling 'wintery' still. Shop a similar dress here and more options below! Sock boots are one of the biggest shoe trends this fall season. You’ll see it everywhere from the runway to all the retail stores. But how to style them is a whole different story. 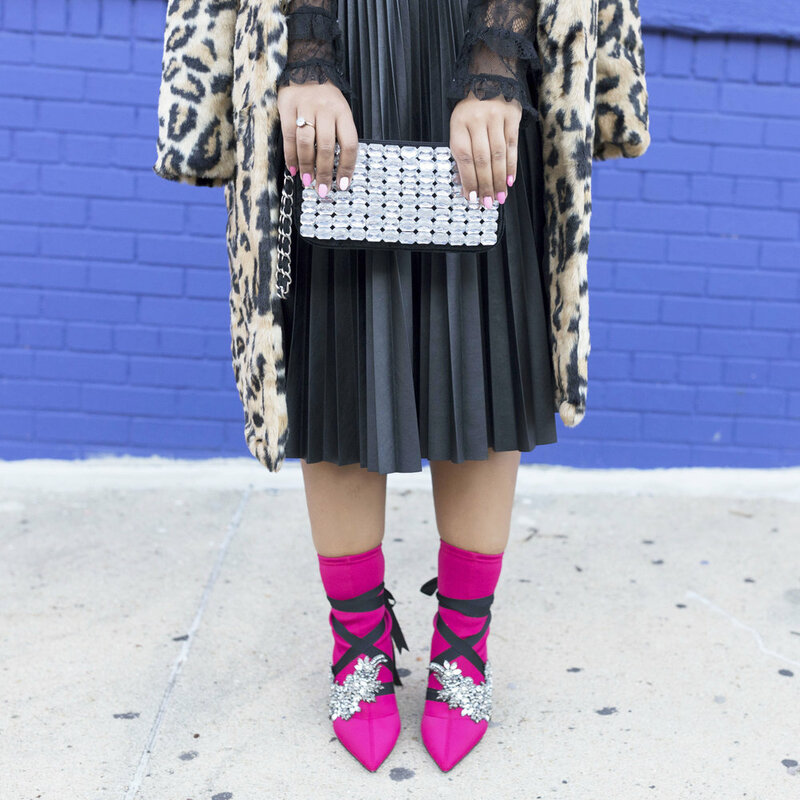 I’m showing you three simple ways you can style the sock boots from work, party, to play. The boots from this post are from Mango but keep scrolling for great options! I know many places have a strict dress code, but there is a little wiggle room when it comes to shoes. Sock boots may be trendy but it is easy to dress them up to be work friendly. My best tip is find a tailored blazer the same color as your sock boots. A blazer is a key piece to making any look professional and all business. You can either wear the blazer and boots with a sophisticated dress or pair it with trousers and a blouse. The look is clean with a bit of fun. 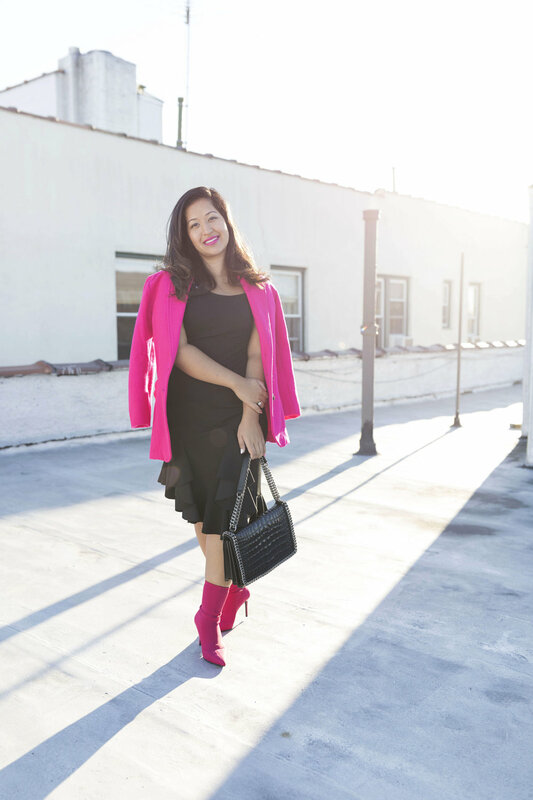 I’m all about hot pink blazers this year and I’ve linked some great options for you below! One way to really turn heads at a party are with these pink sock boots. You can change it up by adding a little sparkle to the shoes. I got a piece of ribbon and added crystal pieces by sewing them on to the ribbon (you can glue them on too). Another option is to buy broaches and pin them on to the ribbon. Your shoes deserve to get dressed up too! One of my favorite pieces of clothing I have ever bought is this pleated leather midi skirt. It is such a interchangeable piece that looks good casual or dressed up. See previous posts here, here, and here where I styled the skirt in several other ways. It is a perfect party skirt! I love midi length skirts paired with mid calf booties because it is the right length to show off the boots. Pair an edgy leather skirt with a feminine lace blouse to create the perfect balance. 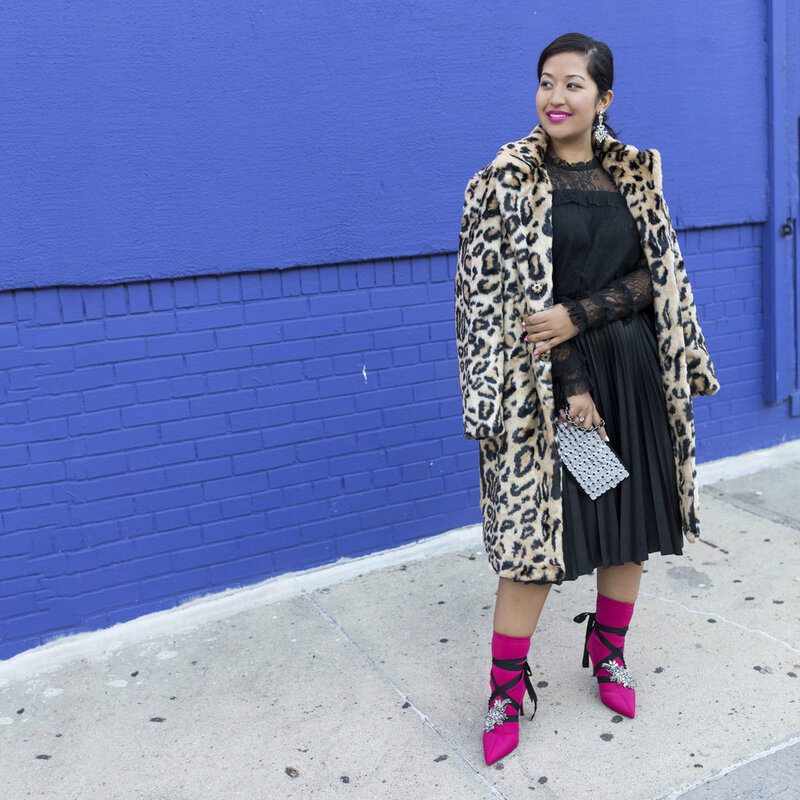 Faux furs are all the rage and a little cheetah is key for a fashion girl. The print is fun and a neutral print so it goes with everything. I love the length and style of this coat from Forever 21. The weekends are all about play and your outfit should be on the same page. What better to kick off the weekend with a pair of fun boots that are actually comfortable? Sock boots are trendy but surprisingly quite comfy. They feel like you're wearing socks with a heel attached. I still wear real socks with the boots though. I love to wear denim during the weekends and the two tone look is such a fun way to do denim. 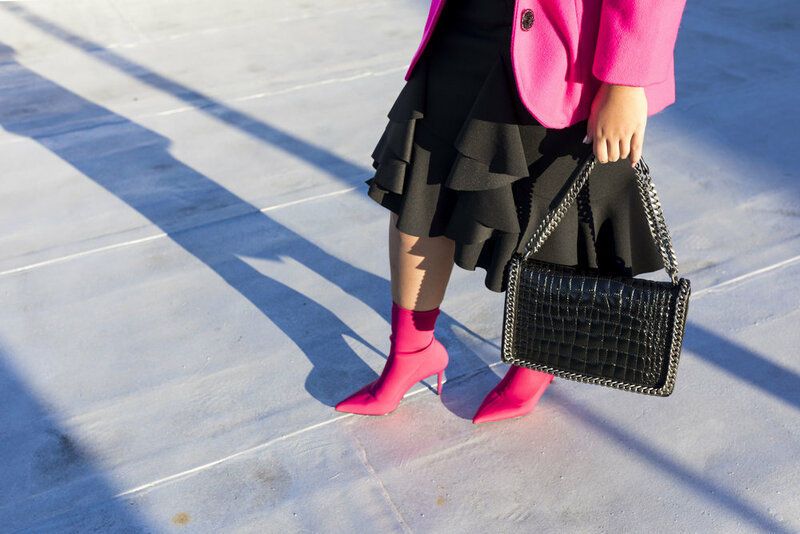 The pink boots are sweet so to mix it up, with something edgy and tough. 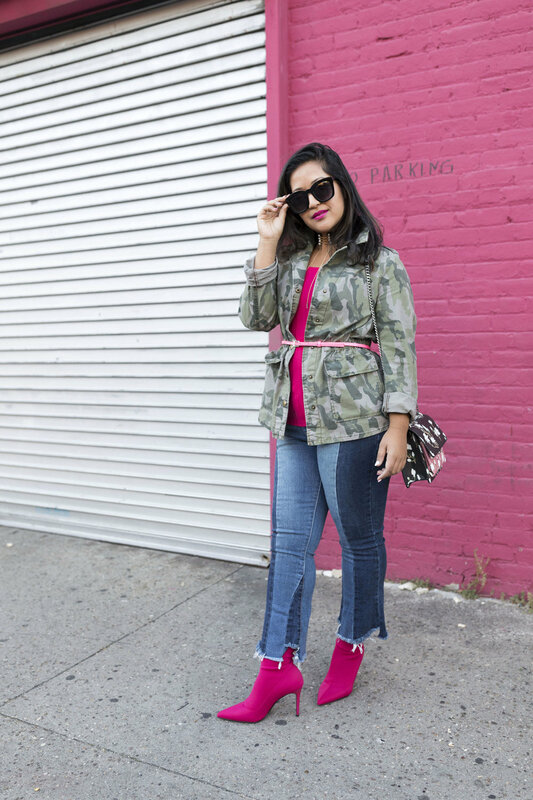 I styled it with another favorite classic of mine- the camo jacket. 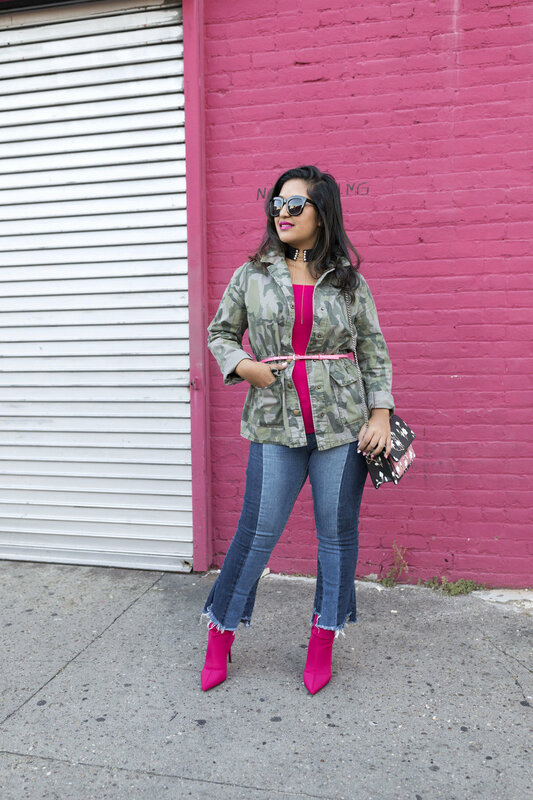 Camo is a print that works with just about anything, including hot pink boots. Have fun weekend-ing while staying trendy! This summer, it's all about set dressing. Two piece sets are everywhere! I love this two-piece set because the cute ruffle details, the thigh high slit, and I don't need to worry about flashing anyone thanks to the built in shorts under the skirt! It's the perfect combo for the summer and so on trend. I also like how I can wear the top with a pair of jeans or pair the skirt with a t-shirt for a completely different look; basically two outfits in one. This set is versatile and great for so many occasions. I am wearing a size large and fits well. I am usually a size 6/8. Shop this amazing set HERE and scroll down for all the other pieces I am wearing!